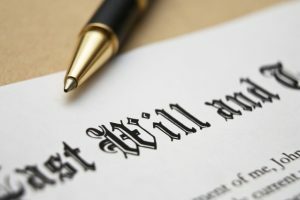 A Will is a written document that directs the disposition of a person’s property after death. It also allows you to name a Personal Representative, who administers your estate. If you die without a Will, your property passes according to the laws of the State. By having a Will in place, you decide who the beneficiaries will be, not the State. It is important to secure the advice of an attorney, to tailor the document to your needs. 1. Legal age – you must be 18 years of age or older. 2. Sound mind – you must know you are executing a Will. 3. Intent to transfer property – must have a provision that disposes of property. 4. Written – Wills must be written and witnessed. 5. Properly signed – you must voluntarily sign the Will. 6. Properly witnessed – the signing of a Will must be witnessed by two adults. 7. Properly executed – it must have a statement attesting it is your Will, along with the date and place of signing, and that you signed it before witnesses. Having a Will in place brings peace of mind to you and your loved ones, knowing your wishes will be carried out.